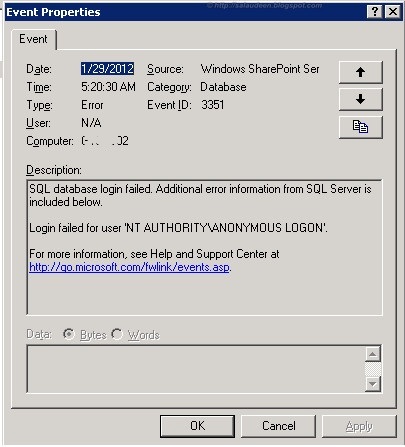 Home Event Log SharePoint SQL Server Troubleshooting Event ID 3351: SQL database login failed. Login failed for user 'NT AUTHORITY\ANONYMOUS LOGON'. Event ID 3351: SQL database login failed. Login failed for user 'NT AUTHORITY\ANONYMOUS LOGON'. After joining a new server to an existing SharePoint farm found this error logged multiple times in the newly added server. Event Log 3351: SQL database login failed. Additional error information from SQL Server is included below. Login failed for user 'NT AUTHORITY\ANONYMOUS LOGON'. Root cause & Fix: This is because SharePoint Timer Services was running with "Local System" account. Changed it to Domain Account with necessary rights and fixed this issue. In an another case, "Windows SharePoint Services VSS Writer" service was running with local system account, and I had to change the account to a service account from AD.